Do you get frequent headaches? Is the pain feel out of control? Do you feel like your about to lose your mind? I hear you! There are several different kinds of headache. Have you ever had a headache so bad you didn't know what to Do? Those aspirins aren't working ... Now what? It's that simple ... You call and we Will deliver that mobile massage to your door. Massage can not only help relieve those headaches but also help prevent them from coming back. Book one today ! DON'T live in pain when you don't have to! 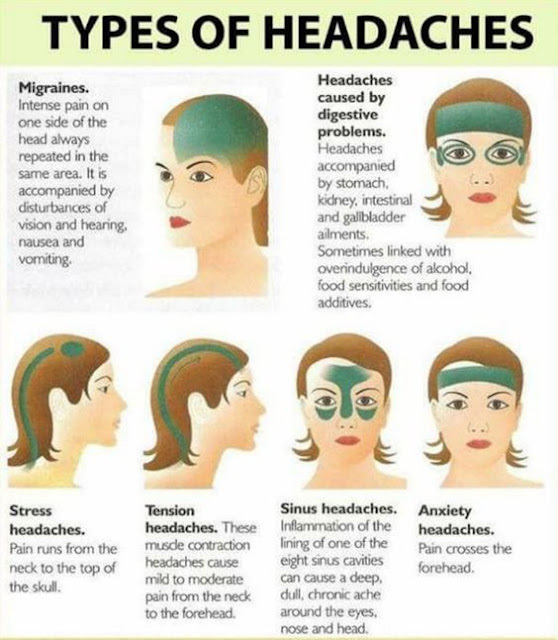 Look at the picture of different headache types. Do you see yours? Ok let's do something about it... call!